A goblet—bowl, foot, and stem—is made on the blowpipe in this video. 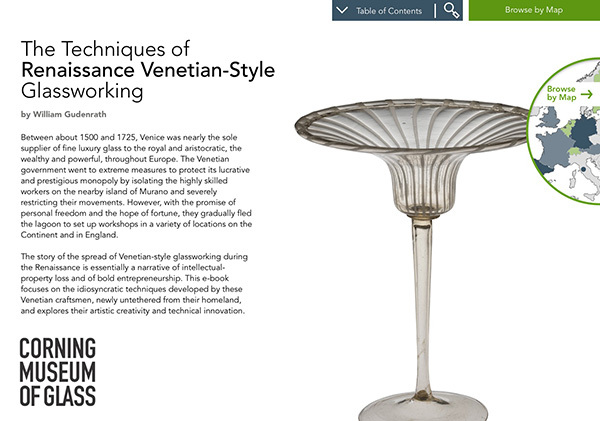 Up until the later 17th century in Venice, goblets were always built on the blowpipe. The process begins by the glassblower making the bowl of the goblet. Next begins a sequence of additions. First, a merese is added. A bubble for the stem is lowered into place. Another merese is added at the bottom at the stem. The foot will sit on this merese. The last part to be added is the foot. After giving the foot its final shape, a punty (or pontil) is added to the base, and the goblet is broken free of the blowpipe. After reheating, the opening process begins. The soffietta is used to inflate the glass, and the jacks are used to create the final curving profile. The punty is lightly tapped with the pincers. The goblet breaks away and is ready to be placed in the annealing oven for slow cooling.